Marcus Paul Murro was born June 4, 1949 in Newark. Mark had great body control and an explosive arm. He excelled in any sport that involved throwing. He also enjoyed heaving bricks through the upper-story windows of abandoned buildings, and was arrested at least once for this hobby. Tony Naclerio, a track coach at Essex Catholic High School introduced Mark to the javelin, and the rest was literally history. After breaking Terry Bradshaw’s world high-school record with a throw of 252’ 8”, Mark was recruited by Ernie Bullard to compete for Mesa Junior College. While using an old-style javelin, Mark set a NJCAA record with a throw of 273 feet that still stood nearly 50 years later. As an 18-year-old freshman, Mark made the 1968 U.S. Olympic team and competed in Mexico City. He was the only American to qualify for the finals, and ended up finishing 9th. 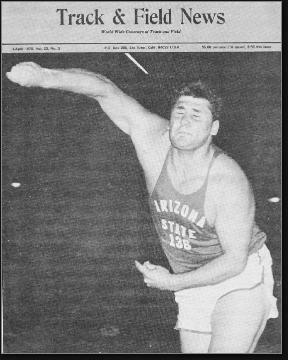 Mark earned a scholarship to Arizona State after the Olympics and, working with coach Baldy Castillo, won the NCAA title in 1969. He set a new NCAA mark with a throw of 292 feet and was named an All-American. As a junior in 1970—still using the old-style javelin—Mark became the first American to reach 300 feet. Two months later, Mark sprained his ankle in a California meet. A magnificent physical specimen with great focus and stamina, he pushed himself to come back too soon and the damage never healed. Mark tried to adjust his technique, but never reached his potential, peaking at #3 in the world rankings. In 1971, Mark accidentally speared his toe during the NCAA finals and finished second. He failed to make the 1972 Olympic team and retired from the sport in the late 1970s. Although he occasionally worked with young throwers, he did not get into coaching and did not compete at the Masters level. Mark got into the construction business in Arizona, and still works for a Phoenix-area builder.